Producing food for the world’s growing rural and urban populations starts with agricultural land. Reducing current high levels of hunger and malnutrition, as called for by the Sustainable Development Goals, will depend on land use decisions and governance from the global to the local level. Improving food security at both the global and local level will require land governance that creates incentives for greater productivity and improves access to nutritious food for the poor and vulnerable, without creating further strain on environmental services. More efficient use of agricultural land can boost crop yields and meet growing global demand for food. Smallholders have a vital role to play, both because they produce much of the world’s food and because they represent a large share of the world’s poor and food insecure. At the local level, land tenure security, along with access to other resources, is linked with increased productivity and investments in land fertility, which in turn can increase food security . What holds for small farmers in general is even more critical for women. Empowering women through more secure land rights and greater control over household decision making not only boosts production of food crops but also leads to improved nutrition for families. However, climate change and resource degradation are reducing yields and available land, threatening to slow or reverse progress on world hunger . Addressing these new challenges requires investment in sustainable and climate-smart intensification. What is needed to improve food security? Natural and social science data, knowledge, and tools will all be essential to address the coming challenges . Solutions will include improved crop varieties and agricultural technologies, and just as importantly, improvements and adaptations in the social and economic systems that link land to food security outcomes, including governance, incentives, markets, and investments. Food demand is expected to increase by as much as 70 percent by 2050 . This increase will need to be met largely with further improvements in yields . Use of better varieties and investments in agricultural management have substantial potential to meet global demand sustainably without expanding agricultural land . However, to meet the growing demand, substantially faster growth in yields will be required . Global quantities of agricultural production are important, but do not ensure that the poor and vulnerable have access to a sufficient and nutritious diet—meaning not only enough calories for an active, healthy life, but also vital nutrients and micronutrients (such as calcium, iron, and zinc) . Increased food production dramatically decreased global hunger in the last 50 years , but both agricultural yields and access to food vary dramatically across regions, countries, and communities . The Global Hunger Index (2016)—which measures food insecurity in terms of undernourishment, child stunting and wasting, and child mortality—finds that seven countries suffer “alarming” levels of hunger and 43 suffer “serious” levels . Africa south of the Sahara and South Asia suffer hunger levels substantially above other regions. Malnutrition has high costs—global economic losses are estimated at US$1.4–2.1 trillion per year . Local hunger and malnutrition are not the result of a global food shortage—although natural disasters, competition from non-food crops, and disruptions of food systems in conflict zones can contribute to the problem. Rather, hunger and malnutrition are the result of food systems that fail to meet the needs of the poor and vulnerable. Addressing food insecurity will depend on increasing land productivity and on improving physical, social, and economic access to adequate, nutritious diets globally and locally. Some 475 million smallholder farmers in the developing world produce an estimated 80 percent of food in Asia and Africa south of the Sahara . Globally, the food insecure live predominantly in rural areas—and 84 percent of the world’s farms are smaller than 2 hectares . For many of smallholders, access to land is the basis for their livelihoods and a critical factor in families’ food security . As populations increase and land becomes increasingly scarce , addressing the threats to smallholders' access to land is essential to food security . Food aid and safety nets have a critical role to play in ensuring that today’s food needs are adequately met. But long-term food security depends on rural development that includes greater farm productivity, better incomes, and more rural nonfarm jobs. Land lies at the heart of both household-level food security and rural development. Land reforms have focused on redistribution of land to increase access for land-poor and landless farmers, and more commonly in recent years, on improving security of tenure through certification and other schemes . Land rights can take many forms, with different regimes suitable for different types of farming and different communities . Whatever their form, secure rights are: clearly defined, enforceable, appropriately transferable, and socially and legally legitimate . For many smallholders, one or more of these components are missing . Security of land and resource rights is widely recognized as a valuable, and perhaps necessary, prerequisite for improving productivity . When farmers are confident that they will enjoy the benefits of improvements they make to their land and the crops they produce, they are likely to invest more, boosting productivity and incomes . Moreover, financial institutions may be more willing to provide credit for these improvements, or insurance against losses . For example, land titling in Latin America and Asia has been linked with increased investment . In Ethiopia's Tigray region, certification led to a 40–45 percent increase in productivity; and in Rwanda, soil conservation investments doubled . The link from tenure security to productivity and consequently to food security is logical, but has only been demonstrated in a few studies . The reform in the Tigray region, for example, increased food production and food access for poor, female-headed, sharecropping households . Many smallholders are hampered not only by weak land rights but also by poor land quality or other conditions of poverty and vulnerability, such as poor access to agricultural technologies and knowledge, markets, and off-farm employment opportunities. Many live in regions where risks of natural disaster are high. In fact, most smallholders are net buyers of food for reasons including insufficient land, land degradation, natural disasters, and seasonality of production . All these factors limit investments and use of credit to increase productivity . How best to increase food production is highly location- and context-specific . Models suggest that yields can be significantly increased in many parts of Africa, Latin America, and Eastern Europe through investment in agricultural R&D, low-cost technologies, and agricultural extension . But for tenure security to lead to rural development that will ensure food security, additional investments are needed in infrastructure such as roads and storage and processing facilities to develop markets and food value chains, and legal and regulatory regimes that foster agricultural markets and nonfarm rural employment . Data on investment in agricultural R&D is available at https://www.asti.cgiar.org/data. Women make up an estimated 43 percent of the agricultural labor force in developing countries, and up to 50 percent in parts of Asia and Africa . But women consistently have less access to land and less security of resource rights, and their farm plots are usually smaller and of poorer quality . Lack of land rights leaves women and children more vulnerable to food insecurity, expropriation, and climate change and shocks . Social, cultural, and legal biases against women’s ownership of land make control over property one of the greatest inequalities between men and women . Women's control over land contributes to women's empowerment , giving them greater say in household decision making, including decisions about what to plant, what investments to make, and what food to buy. Land rights may also increase women’s access to agricultural inputs and support services and to markets . When granted the same access as men, yields on women's plots can rise by 20 to 30 percent . For example, in Rwanda, when land rights were formalized, the increase in soil conservation investments by women was almost twice that among men . The link to food security and nutrition is strong . When women have control over assets, they are more likely than men to make decisions that improve food and nutrition for the family, especially for children . For example, women are more likely to opt to plant food crops to supplement the family diet, rather than high-value crops often preferred by men . The effect is not limited to the food they produce—in Nicaragua and Honduras women who own land are more likely to have control over household income than women who don’t own land, and their families spend more on food . In Nepal, women landowners are more likely to hold sway in family decisions, and their children are less likely to be severely underweight . In countries where women lack rights or opportunity to own land, 60 percent more children are malnourished than in countries where woman have some access to land . While control over land has a major impact, women’s empowerment in agriculture may be limited in other ways. Efforts to facilitate more productive involvement of women in agriculture must consider gender in all aspects of agricultural development and food policy—such as women’s access to markets and financial tools, and the appropriateness of agricultural R&D and extension for women’s needs . The Women's Empowerment in Agriculture Index (WEAI) provides a systematic framework for collecting data on women’s empowerment, which can help in the development of gender-sensitive policies . Climate change and widespread resource degradation, if unaddressed, will have major impacts on the productivity of agricultural land. Significant arable areas have already been lost to desertification, salinization, and soil erosion related to unsustainable land management, as well as to urbanization and other human uses . And the global food system faces increasing competition for its primary inputs: land, water, and energy . Climate change will add to the loss of productive regions through drought, rising temperatures, and change in the distribution of pests and diseases ; yields are expected to decrease by 5 to 7 percent at the global level by 2050 , and whole food systems may be at risk . The world faces a threefold challenge: meeting food demand of a larger and more affluent population, in an environmentally and socially sustainable way, while reducing hunger . A number of technical fixes are already known, but the solution will also require a wholesale reorientation toward sustainability and resilience . Sustainable intensification applies technologies and management practices based on location-specific research to boost yields and long-term productivity with more sustainable resource use . Land management for healthy soils is an essential component of intensification, vital to ensuring a sustainable food supply and resilience to shocks and contributing to CO2 sequestration . Climate-smart agriculture offers a set of tools to increase resilience and help small farmers both adapt to climate change and contribute to mitigation efforts. Technologies include climate-ready crop varieties and water-conservation and soil-enhancing practices: zero-tillage, drip irrigation, and integrated soil fertility management . Orienting smallholders toward these approaches will require policies that ensure land rights and reduce barriers to markets, credit, extension, insurance, and social protection, and that reduce constraints to women’s participation . While changes in land management will need to be implemented at the farm level to improve the food security of farm families and rural communities, countries will also need to address ecosystem needs and broad shifts in productivity at the landscape level (meaning at a larger scale than individual farms) . Climate change will drive changes in what a country can best produce and in comparative advantage, along with changes in global food crop prices . Agriculture is also a source of greenhouse gases, contributing about 30–35 percent of global greenhouse gas emissions through tropical deforestation, methane from livestock and rice, and nitrous oxide from fertilized soils . Landscape-level changes in agricultural production patterns are needed to limit climate change and to improve food security—including not only a halt to the expansion of agricultural land but also more efficient use of water and improved soil management techniques . A wide range of research has looked at, and continues to examine, the complex relationships between land and food security. The examples below illustrate just a few of the findings from this work in countries around the world—including research looking at the role of tenure security for small farmers and women and at efforts to address resource degradation and climate change in ways that improve food security. Smallholders: Land tenure security increased farmers’ long-term investments in agricultural land in Ethiopia . Farmers who felt that their tenure was secure were 60 percent more likely to invest in terracing, which helps to maintain soils and land productivity, than those fearing expropriation, according to one study . Land certification meant that farm households were more likely to invest in trees and terracing  and increased their calorie intake . For poor, female-headed households, production increased and their access to food increased even more with certification than the average for all farmers . Gender: In Nepal, where about 80 percent of households depend directly on the land for their livelihoods, almost 90 percent of women workers are in agriculture but only 14 percent of land-owning households include women landowners . In those households, food security is enhanced: women are more likely to have final say in household decisions and children are one-third less likely to be severely underweight. In Uganda, introduction of a new crop variety designed to improve nutrition, the vitamin A biofortified orange sweet potato (OSP), met with a better reception from households where women controlled more land . While OSP was least likely to be adopted on parcels of land controlled by men, adoption rates were highest on jointly controlled parcels for which women were the decision makers. Increased vitamin A intake is associated with reduced illness in children . Resource scarcity: To address severe pressure on land resources and land degradation in southern Malawi, a land reform program resettled farmers in another area, providing each household with 2 hectares of land, a cash grant, and access to services to promote sustainable intensification . Production increased, most likely because of increased farm size. Productivity increases were likely constrained by the remoteness of the new plots, which reduced access to markets for inputs and outputs. In addition, the formal land titling process favored men’s ownership, while traditional land tenure rules had given women more access to land resources. Climate change: Addressing climate change will require sound decision making about land use at the landscape level. In Colombia, global models of climate change impacts were used in conjunction with local-level data to help the country formulate its international commitments on climate change . The exercise highlighted the economic trade-offs, opportunities, and repercussions of various land use options. Investments in livestock productivity showed potential to reduce deforestation, while expansion of palm oil appeared likely to reduce other perennial crops. FAOSTAT cited by J. A. Foley, N. Ramancutty, K. A. Brauman, Emily S. Cassidy, James S. Gerber, Matt Johnston, Nathaniel D. Mueller, Christine O’Connell, et al., “Solutions for a Cultivated Planet,” Nature 478, no. 7369 (2011): 337–342. Food and Agriculture Organization of the United Nations, International Fund for Agricultural Development, and World Food Programme, The State of Food Insecurity in the World 2015: Meeting the 2015 International Hunger Targets: Taking Stock of Uneven Progress (Rome: Food and Agriculture Organization of the United Nations, 2015). Availabe at: http://landportal.info/library/resources/978-92-5-108785-5/state-food-insecurity-world-2015. H. C. J. Godfray, J. R. Beddington, I. R. Crute, L. Haddad, D. Lawrence, J. F. Muir, J. Pretty, S. Robinson, S. M. Thomas, and C. Toulmin, "Food Security: The Challenge of Feeding 9 Billion People," Science 327, no. 5967 (2010): 812–818, Available at: https://landportal.org/library/resources/101126science1185383/food-security-challenge-feeding-9-billion-people. C. Schmitz, et al., “Land-use Change Trajectories up to 2050: Insights from a Global Agro-Economic Model Comparison,” Agricultural Economics 45, no.1 (2014): 69–­84. J. A. Foley, N. Ramancutty, K. A. Brauman, Emily S. Cassidy, James S. Gerber, Matt Johnston, Nathaniel D. Mueller, Christine O’Connell, et al., “Solutions for a Cultivated Planet,” Nature 478, no. 7369 (2011): 337–342. Foley et al. 2011; J. Ranganathan, D. Vennard, R. Waite, T. Searchinger, P. Dumas, and B. Lipinski, “Shifting Diets: Toward a Sustainable Food Future,” in Global Food Policy Report 2016 (Washington, DC: International Food Policy Research Institute, 2016), 13–21, Available at: http://ebrary.ifpri.org/cdm/ref/collection/p15738coll2/id/130210. Godfray et al. 2010; Foley et al. 2011.
http://landportal.info/library/resources/101038ncomms11382/exploring-biophysical-option-space-feeding-world-without; N. D. Mueller, J. S. Gerber, M. Johnston, D. K. Ray, N. Ramancutty, and J. A. Foley, “Closing Yield Gaps through Nutrient and Water Management,” Nature 490 (2012): 254–257, doi: 10.1038/nature11420. J. H. J. R. Makoi, M. K. van Ittersum, and K. Wiebe, Can Tanzania Feed Itself by 2050? Estimating Cereal Self-Sufficiency to 2050, Research Summary (Washington, DC: International Food Policy Research Institute, 2017). World Bank, From Agriculture to Nutrition: Pathways, Synergies, and Outcomes (Washington, DC: 2008). http://landportal.info/library/resources/40196-glb/agriculture-nutrition-pathways-synergies-and-outcomes. Foley et al. 2010; Makoi et al. 2017. Holden and Ghebru 2016; International Food Policy Research Institute, Global Food Policy Report 2011, (Washington, DC: 2011). Landesa, Land Rights and Agricultural Productivity, April 2012; F. Place, M. Roth, and P. Hazell, "Land Tenure Security and Agricultural Performance in Africa: Overview of Research Methodology," in Searching for Land Tenure Security in Africa, ed. J.W. Bruce and S. E. Migot-Adholla, (Dubuque, IA: Kendall Hunt Publishing Company, 1994), 15–39; R. Prosterman, R. Mitchell, and T. Hanstad, One Billion Rising: Law, Land and the Alleviation of Global Poverty (Leiden, the Netherlands: Leiden University Press, 2009). Landesa, Land Rights and Agricultural Productivity, April 2012. United States Agency for International Development (USAID), “Land Tenure, Property Rights, and Food Security,” USAID Issue Brief (2010); Landesa, Land Rights and Agricultural Productivity, April 2012; S. Lawry, C. Samii, R. Hall, A. Leopold, D. Hornby, and F. Mtero, "The Impact of Land Property Rights Interventions on Investment and Agricultural Productivity in Developing Countries: A Systematic Review," Journal of Development Effectiveness 9, no. 1 (2017): 61-81. Maxwell and Wiebe 1999; Holden and Ghebru 2016. Holden and Ghebru 2016; S. T. Holden and H. Ghebru, " Welfare Impacts of Land Certification in Tigray, Ethiopia," in Land Tenure Reform in Asia and Africa: Assessing Impacts on Poverty and Natural Resource Management, ed. S. T. Holden, K. Otsuka, and K. Deininger (New York: Palgrave Macmillan, 2013), 137–161. USAID 2010; F. Place and P. Hazell, "Productivity Effects of Indigenous Land Tenure Systems in Sub-Saharan Africa," American Journal of Agricultural Economics 75, no. 1 (1993): 10–19. Crowley 2001; Landesa, “Land Rights and Food Security: The Linkages between Secure Land Rights, Women, and Improved Household Food Security and Nutrition,” Issue Brief, March 2012, https://www.landesa.org/wp-content/uploads/Landesa-Issue-Brief-Land-Rights-and-Food-Security.pdf. https://landportal.org/library/resources/861354002/women%E2%80%99s-empowerment-and-nutrition-evidence-review; A. R. Quisumbing and J. A. Maluccio, "Resources at Marriage and Intrahousehold Allocation: Evidence from Bangladesh, Ethiopia, Indonesia, and South Africa," Oxford Bulletin of Economics and Statistics 65, no. 3 (2003): 283-327. USAID 2016; Ali et al. 2014. Landesa, “Land Rights and Food Security: The Linkages between Secure Land Rights, Women, and Improved Household Food Security and Nutrition,” March 2012. T. Wheeler and J. von Braun, "Climate Change Impacts on Global Food Security," Science 341, no. 6145 (2013): 508–513. https://landportal.org/library/resources/climate-change-and-agricultural-policy-options-global-local-approach; K. Wiebe, H. Lotze-Campen, R. Sands, A. Tabeau, D. van der Mensbrugghe, A. Biewald, and B. Bodirsky, et al., "Climate Change Impacts on Agriculture in 2050 under a Range of Plausible Socioeconomic and Emissions Scenarios," Environmental Research Letters 10, no. 8 (2015): 085010, Available at: https://landportal.org/library/resources/1010881748-9326108085010/climate-change-impacts-agriculture-2050-under-range. Wheeler and von Braun 2013.
 de Pinto et al. 2016; M. W. Rosegrant, J. Koo, N. Cenacchi, C. Ringler, R. D. Robertson, M. Fisher, C. M. Cox, K. Garrett, N. D. Perez, and P. Sabbagh, Food Security in a World of Natural Resource Scarcity: The Role of Agricultural Technologies (Washington, DC: International Food Policy Research Institute, 2014), http://ebrary.ifpri.org/cdm/ref/collection/p15738coll2/id/128022. Wheeler and von Braun 2013; S. Solomon, et al., eds. Climate Change 2007: The Physical Science Basis: Contribution of Working Group 1 to the Fourth Assessment Report of the IPCC (New York: Cambridge University Press, 2007). de Pinto et al. 2016; IPCC 2014. Godfray et al. 2010; von Braun 2007. J. Koo, E. Nkonya, C. Azzari, C. Cox, T. Johnson, A. Komarek, H.-Y. 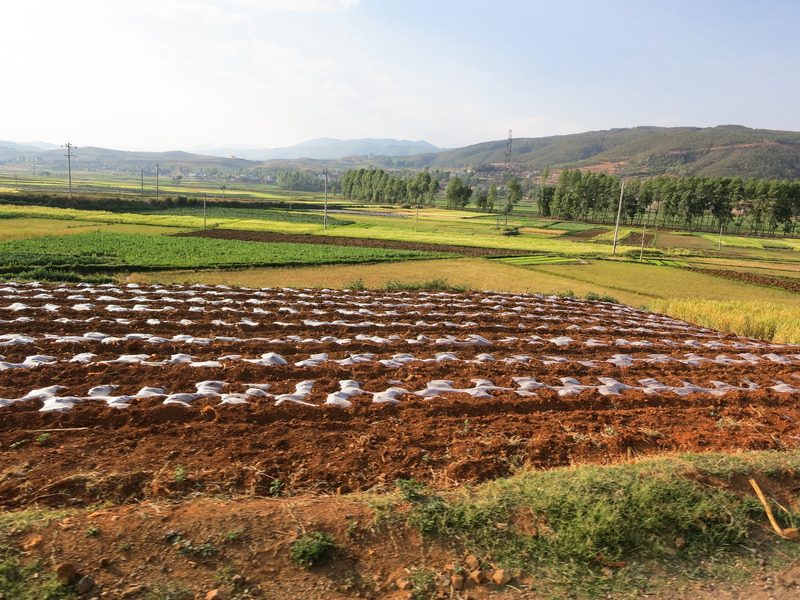 Kwon, et al., “Land and Soil Management: Promoting Healthy Soils for Healthier Agricultural Systems,” in 2016 Global Food Policy Report (Washingon, DC: International Food Policy Research Institute, 2016), 41–47, http://ebrary.ifpri.org/cdm/ref/collection/p15738coll2/id/130213. Koo et al. 2016; FAO 2016.
 de Pinto et al. 2016; Koo et al. 2016.
 de Pinto et al. 2016. Gofray et al. 2010; Foley et al. 2011; Nelleman et al. 2009. V. Mueller, A. R. Quisumbing, H. L. Lee, and K. Droppelmann, “Resettlement for Food Security’s Sake: Insights from a Malawi Land Reform Project, Land Economics 90, no. 2 (May 2014): 222-236. http://le.uwpress.org/content/90/2/222.abstract. A. de Pinto, K. Wiebe, and M. W. Rosegrant, Climate Change and Agricultural Policy Options: A Global-to-Local Approach, IFPRI Policy Brief, (Washington, DC: International Food Policy Research Institute, 2016), Available at: https://landportal.org/library/resources/climate-change-and-agricultural-policy-options-global-local-approach.